I have a country map with province labels written in black. I want to remove these black texts. The problem is that the rest of the image is in different colors, depending on which province it is. 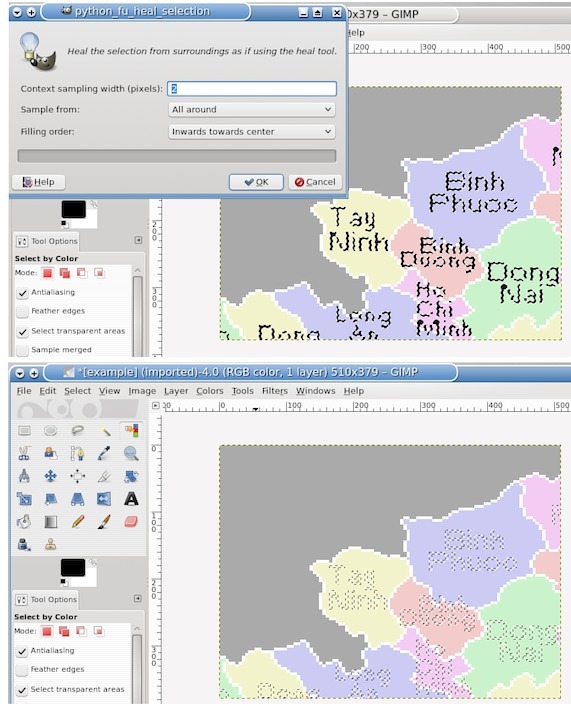 Right now I'm doing it manually: rectangle select each text, color exchange it from black to the color of the province. Whenever a text is written over two province I may have to manually draw in the right colors using the Pencil Tool. Is there a way to convert all black pixels in my image to the nearby colors (could be red, could be green, etc., depending on the nearby pixels)? Use the eyedropper to pick up the providence color, then use the brush tool to paint out the text. 1 click the clone stamp tool. 2. Hold ctrl and left-click a clean color source to clone/copy from. 3. Let go of ctrl & left-click. Then click drag to paint over with clone stamp. 1. Pick the eyedropper , click on the providence color. 2. Create a new transparent layer "Layer > New Layer "()transparent"
The method I used requires the G'MIC plugin to be installed with your version of Gimp. If already installed you will find it under Gimp's Filters->G'MIC menu. 4. Selection->Grow by 1 pixel. Just an exercise in, "how short a procedure" might be possible. I was thinking about recommending the re-synthesizer plug-in but as this is a beginner section, it might be a bit confusing to install. Now, if the .py(python) script "heal-selection" can be installed as a stand alone(without resynthesizer plugin), then that would be another option.